In2Rail Final Conference - 19 April 2018, Vienna - Register! In this paper the influence of wheel/rail contact conditions on the possible occurrence of curve squeal is investigated. A reference case is presented, together with the available experimental data, and the results of numerical simulations are illustrated. The analyses reported in the paper are based on two calculation steps. First 3D multibody simulation of a rail vehicle running in curve is carried out. Then squeal simulation is performed, which is based on linear wheel and rail dynamic models, coupled through a nonlinear contact model. Stability analysis of the open loop transfer function of the overall system yields the possible unstable frequencies. Mr. Manuel Alfageme Alonso (COMSA) participated in the BCN Rail Conference 2015 with a presentation on Key on-going railways energy efficiency innovations, linked to In2Rail project. Luleå University of Technology and Luleå Railway Research Center (JVTC) hosted the 19th Nordic Seminar on Railway Technology 2016. The purpose of the seminar was to gather participants from the Nordic countries being active in the railway field, for instance from universities, institutes, authorities, manufacturers, operators, maintenance companies, and consultancies. State-of-the-art train delay prediction systems neither exploit historical data about train movements, nor exogenous data about phenomena that can affect railway operations. They rely, instead, on static rules built by experts of the railway infrastructure based on classical univariate statistics. The purpose of this paper is to build a data-driven train delay prediction system that exploits the most recent analytics tools. The train delay prediction problem has been mapped into a multivariate regression problem and the performance of kernel methods, ensemble methods and feed-forward neural networks have been compared. Firstly, it is shown that it is possible to build a reliable and robust data-driven model based only on the historical data about the train movements. Additionally, the model can be further improved by including data coming from exogenous sources, in particular the weather information provided by national weather services. Results on real world data coming from the Italian railway network show that the proposal of this paper is able to remarkably improve the current state-of-the-art train delay prediction systems. Moreover, the performed simulations show that the inclusion of weather data into the model has a significant positive impact on its performance. The article discusses research results from the European project In2Rail and gives an application-oriented example of digitalization in the railway infrastructure. Today´s protection and control architectures are compared with the new possibilities opened by components supporting IEC 61850 process bus. Besides the architectural comparison, the pros and cons of classic as well as digital architectures are presented. The outcomes are transferred in the architecture for an upcoming demonstrator of a digital substation. 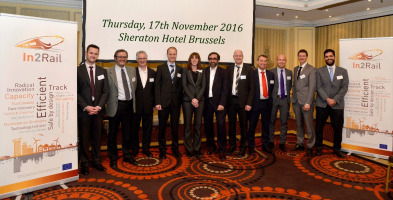 In2Rail Mid-term Conference took place on 17 November at the Sheraton Hotel in Brussels and was attended by more than 70 participants coming from all across Europe. Jointly organized by UNIFE and Network Rail and moderated by Ms. Mona Sihota (Network Rail), it was the occasion for the partners to present the first project’s achievements results and discuss with external participants about the next steps. The conference was opened by Network Rail with a welcome speech made by Prof. Andy Doherty who welcomed all the participants and stressed the importance of In2Rail as it sets the foundations for a resilient, consistent, cost-efficient, high capacity European network by delivering important building blocks that unlock the innovation potential that exists in Shift2Rail (S2R). The innovative technologies addressed by In2Rail will be explored and resulting concepts will be embedded in a systems framework where infrastructure, information management, maintenance techniques, energy, and engineering are integrated, optimised, shared and exploited. First achievements include the state of the art across various European partners, the development of a common approach to innovation value analysis (for both In2Rail & Shift2Rail), building upon European project outputs at Technology Readiness Level 3 (TRL3) moving on the work in S2R to TRL 6. Moreover, first promising results are beginning to be seen from radical new concepts across the project e.g. radical switch design in Work-Package 2 (WP 2), potential 3D printing of track components and improvement of maintenance activities. The Conference continued with presentations and discussions on the main achievements in the three Sub-projects, focused on Smart Infrastructure, Intelligent Mobility Management and Rail Power Supply/Energy Management. Mr. Henk Samson (Strukton Rail), Dr. Ian Coleman and Mr. Ian Dean (Network Rail), Mr. Anders Carolin (Trafikverket) and Mr. Federico Papa (AnsaldoSTS) opened the technical session by presenting the main achievements so far in the Sub-project on Smart Maintenance by addressing a number of working areas including Switches and Crossings, Track, Bridges/Tunnels, Commercial Off the Shelf (COTS) Monitoring and Maintenance Strategies. The conference continued with a second set of presentations focused on the Sub-project on Intelligent Mobility Management (I2M). Mr. Carlo Dambra (AnsaldoSTS), Stefan Wegele (Siemens) and Roland Kuhn (Bombardier Transportation) reported on the main outcomes in the areas of System Engineering, Integration Layer and Nowcasting/Forecasting. Finally, Sub-project on Rail Power Supply and Energy Management was presented by Mr. Olivier Langlois (Alstom) and Tomas Greif, who presented the work done on Intelligent AC Power Supply System and Smart Metering for a Railway Distributed Energy Resource Management System (RDERMS). The presentations were followed by a fruitful discussion with the participants, who showed great interest in the work carried out in the first half of the project. Andy Doherty concluded the event, with thanks to UNIFE for the organisation of the mid term event venue, and thanks to Network Rail for the coordination of the In2Rail project. In2Rail was presented during Innotrans from the UNIFE stand on 21st September 2016. In2Rail was presented along with the two other Shift2Rail Lighthouse projects. Shift2Rail Executive Director Mr. Borghini and UNIFE Director-General Mr. Philippe Citroën introduced the session with a general presentation on the importance of the three Lighthouse projects (In2Rail, Roll2Rail and IT2Rail) as preliminary input to Shift2Rail work. After that, the three projects were presented, focusing on the main achievements of the projects after 18 months of activities. Mr. Ian Dean of Network Rail (WP3 Leader) illustrated the main objectives and first results of In2Rail. Mr. Dean highlighted the contributions of In2Rail towards the overall Shift2Rail objectives of increased capacity, reliability and LCC. The outputs of In2Rail will have an impact especially on the activities in IP2 and IP3 of Shift2Rail. He then addressed the future activities in the three sub-projects focused on Smart Infrastructure, Intelligent Mobility Management and Rail Power Supply/Energy Management. At the end of his presentation, Mr. Dean informed the participants that the Mid-term conference of In2Rail will take place on the 17th of November in Brussels. The event will be jointly organized together with Roll2Rail, IT2Rail and SmartRail. We welcome you to register for the Mid-term conference via our website. During Innotrans the In2Rail brochure and the newly released Newsletter was distributed at UNIFE stand. The In2Rail presentation at Innotrans can be downloaded HERE. 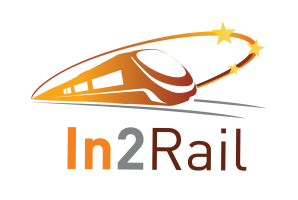 The In2Rail project kick-off was successfully held in Brussels on 7 May 2015. The event was organised in two parts: a common session with the other lighthouse projects started under the Horizon 2020 first call and specific sessions for each individual project.